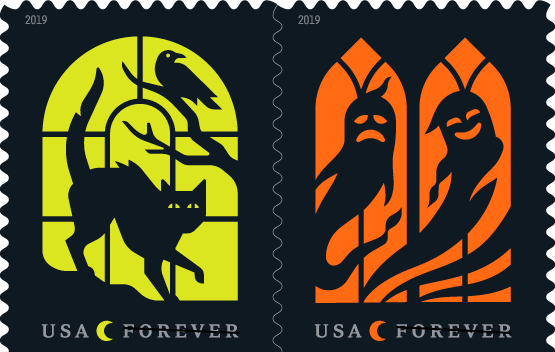 The United States Postal Service has kicked off this year’s Halloween celebration with this week’s announcement of a new series of four Halloween-themed stamps to be released in 2019. From the official press release: Halloween has long been a holiday that lets us delight in the things that scare us. With the approach of autumn, Spooky Silhouettes stamps will offer fun, frightful scenes that symbolize this annual celebration. Four stamps feature digital illustrations in which traditional Halloween motifs are rendered as black silhouettes in eerily backlit windows. Artist Tyler Lang created the artwork. Art Director Greg Breeding designed the stamps. More details, including dates and locations for the first-day-of-issue ceremonies, will be coming soon. The only other time our favorite holiday (way of life) was honored in this way was upon the release Halloween stamps in 2016, the first time the Postal Service officially got into the spirit. You can see the new 2019 “Spooky Silhouettes” series of four Halloween stamps, featuring images of a black cat, spider, bats, and ghosts, below.